‘Arena of Valor’ News: AoV Prime Details, Cybercore Wukong, and Amily! I woke up this morning planning to write a fairly short Arena of Valor news round-up. Even with the patch going live early yesterday, it felt like most of what was set to arrive had already been covered in last week’s edition. While that’s still more or less true, a lot more went on behind that scenes that I fully realized. Perhaps overshadowed by the patch itself. If you missed the news last week, you should read that first. Let’s get to it! It wasn’t made clear through any official channels, but we fully expected the Valor Pass to come AoV Prime made its way into the game. We were wrong. AoV Prime is now active and available. 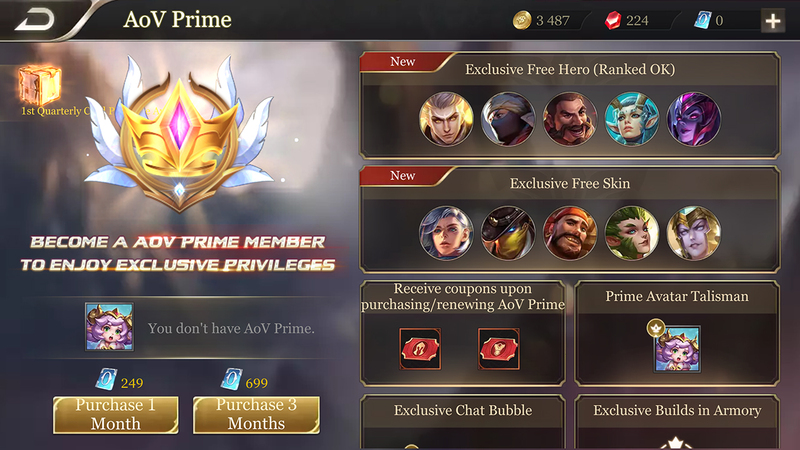 In case we didn’t cover it enough in the past, AoV Prime is a monthly subscription that awards players with a larger free hero rotation to use in Ranked, a rotating set of skins to borrow, discounts on select purchases each month and a few community cosmetic differences to flaunt your expendable income and/or dedication to anyone who runs into you in-game. AoV Prime costs 249 vouchers each month. There’s nothing on there that you’ll keep if you let your sub run out, but it’s not nearly as expensive as we expected. To tempt early adopters, you’ll even get the new Don Maloch skin for free if you subscribe for three months in one go. What we expected to arrive in the August update will only kick in with next week’s rotational change. On Monday, the Valor Pass comes into effect, and it’ll spice things up for both free users and those who decide to pay for something a little extra. Valor Pass is similar to the other “pass” systems in games like Fortnite, PUBG and soon, Rocket League by opening up specific challenges for players to complete for set rewards. Paying players will have access to more challenges and greater rewards, but there’s still something for everyone so long as you’re not expected all that much. Simply put, completing challenges on your Valor Pass awards points used to level it up, with the rewards you earn based on its current level. From our understanding, free players will be able to hold 3 challenges at a time with a new one being added each day. Challenges expire after 72 hours, so there’s a time limit even if you hold onto them. 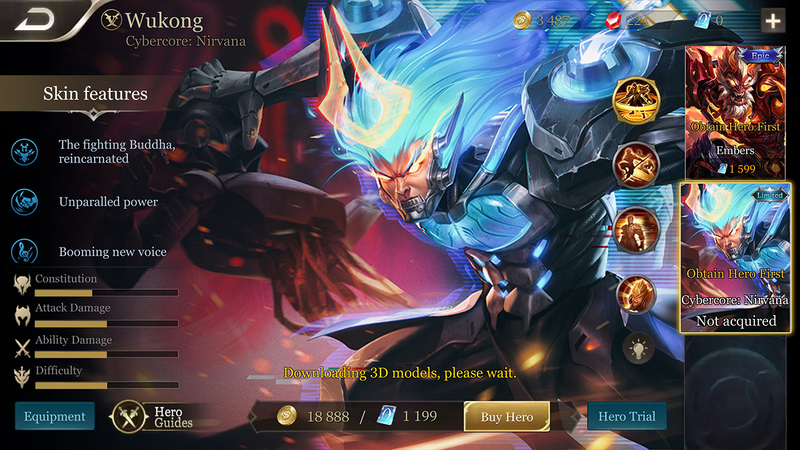 One of the biggest pulls of the Valor Pass will undoubtedly be the release of the newest Cybercore skin: Cybercore Wukong. We don’t know exactly how it will unlock just yet, but be prepared for a premium currency ride like the last two Cybercore skins. If you remember back to the Cybercore Nakroth release, Wukong was heavily teased at the same time. Amily Slices Up The Battlefield (tomorrow)! It’s Friday! That usually means new hero day when we’re expecting one, but that’s not the case this time around. Rather than arriving mid-week like a few others have in the past, Amily, a new warrior/tank character, is set to go live tomorrow – Saturday, September 1. Maybe she wanted to ring in the new month in style, or perhaps she was actually delayed slightly while people grow accustomed to the new map. We suspect the latter, but you never know with these things. And no, Amily is not that Groot-style creature you’re seeing on the Arena of Valor main menu screen. That’s a story for another week. A Saturday release makes talking about Amily a little more difficult than most new hero releases we touch upon in the weekly round-ups, as it means there’s no official Character Spotlight video to add in as a visual aid. 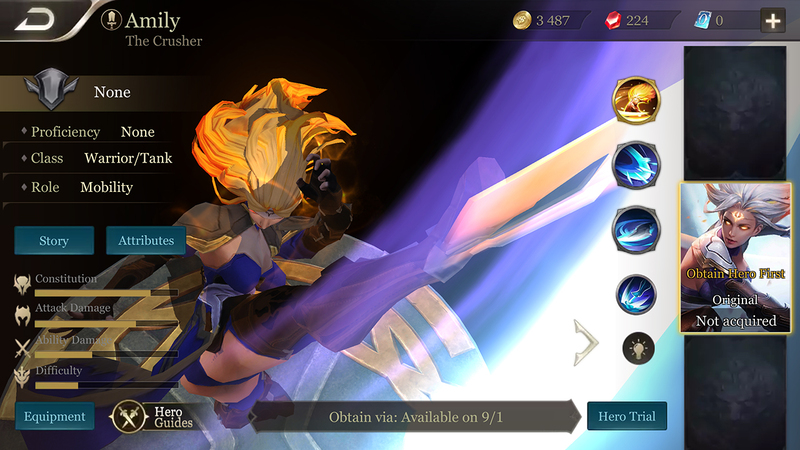 She reads like an Assassin in most cases, with the passive making her auto-attacks and second ability hit for 50% more damage when against a single target. Her first ability, Kickblade, ricochets 4 times across nearby enemies, slowing them down and speeding her up. Once the boomeranging blade returns, Amily gains HP and a shorter cooldown. Her second ability, Combo, is what can deal more damage to a single target thanks to her passive. It chains attacks on a target for physical damage, with the second hit launching her foe and causing the third to hit for additional damage. Once unlocked, Combo activates another passive that grants Amily HP and Mana regen on top of another movement speed boost. Valor Series Season 2 is now in full swing, with the second leg of qualifiers set to take place this weekend. Following feedback on last week’s initial qualifier, some changes have been put in place to hopefully make timings a little easier on everyone. Timezones and estimated playtimes make running competitive competition like this a bit of a pain. To alleviate those concerns, this week’s Valor Series qualifier will be split into two days; Saturday, and Sunday. Rather than rolling on until every match is finished on a single day, the changes mean Saturday will continue until Ro8 is reached in the Winners Bracket and Ro16 is reached with the Losers Bracket. The day will then end with the rest of the matches set to play out on Sunday. Matches will be on a strict Bo1 (best of one) format, with the Grand Final being a standard Bo3. 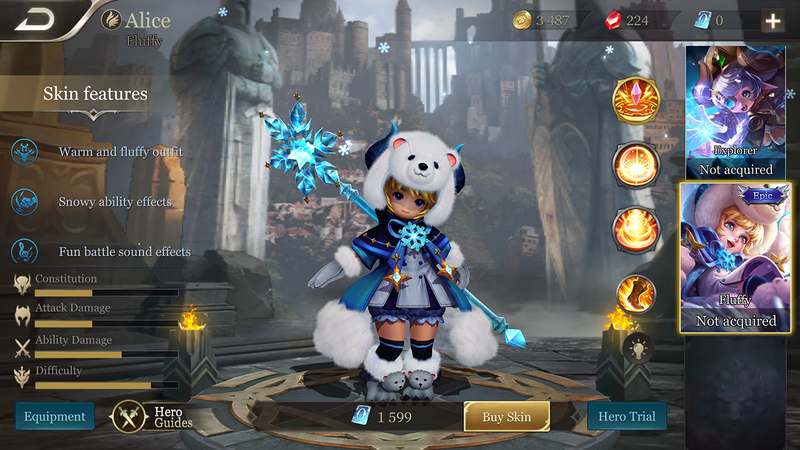 While everyone gushes over the look of the new Fluffy Alice skin, we can be sure that they won’t be so pleased about the price. What honestly looked like a skin that would command a similar price to the support princess’ only other skin, the super cheap Explorer Alice, turned out to be classed as an ‘Epic’ skin with an equally large-sounding price. Fluffy Alice will set you back a whopping 1599 vouchers. You’ll get a frosty new staff, fuzzy bear hat and new sound/visual effects, but that price still can’t get Alice some leggings to keep her extremities from freezing off. At least she’s wearing some longer socks, though. Anyone else think she looks a bit ordinary without the horns?